Classic S Black, slim letter box by Bobi in RAL 9005. Accessed by a key lock supplied with three keys. Front loading A4 letter slot with rain protective flap. Easy removal of contents via drop down door. Zinc plated steel with a UV-protected polyester coating. Resistant to extreme weather conditions and rustproof. 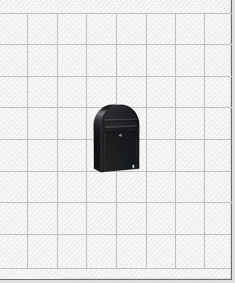 Bobi	The Bobi Classic S Letter Box Black is constructed from zinc plated steel ensuring durable protection and resistance against extreme weather conditions. This slim version of the Bobi Classic still has the Capacity to store large volumes of post. The Bobi Classic S Letter Box series attractive slim design incorporates a rounded top and front A4 letter slot which is fitted with a protective flap to resist rain.